Louise is what happens when you combine an elite Olympic Athlete with a Fitness Expert, Model, Presenter and Sports Fashion Guru. 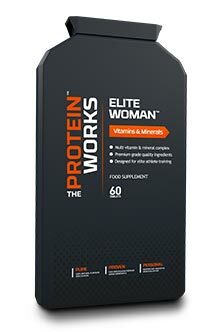 The latest addition to THE PROTEIN WORKS™ crop of Legends, she is a rare individual who not only talks the talk, but walks the walk. Louise is a Commonwealth Games Gold Medallist in the demanding Heptathlon event (2010), but since retiring she has established herself as an authority in the world of health and fitness. As a qualified personal trainer and qualified nutritionist specialising in weight loss, she knows her stuff when it comes to the importance of nutrition and exercise. Louise is on a mission to educate the nation with her Podium Effect tour and is proud to be a "Running Ambassador" for The British Heart Foundation. She appears regularly on the box including "The Health Show" with Davina McCall, The Jump, Question of Sport, The Wright Stuff and The Chase, to name but a few. Racing against James May on Top Gear Live, challenged Louise in a rather different way as she ran on foot against his Nissan GTR! "I don't calorie count at all, this would drive me crazy! I definitely eat intuitively now as I'm eating to maintain good health on a daily basis rather than for elite performance. My rules are three meals per day each containing a portion of protein, maximum of two small portions of carbohydrates per day, two fruits per day and 3-5 portions of vegetables. I then take supplements daily to make sure I'm meeting my elevated nutritional needs whether that's because of a heavy training days or filming long hours on TV shows. I'll take a multi-vitamin, sometimes omega 3,6,9, and soy protein recovery powder post training. It's important to eat nutrient rich foods rather than relying on supplementation, but of course they can play a crucial role in achieving your goals. I find the better I eat the more energized I feel and I rarely fall ill. But I have to admit the chocolate protein brownies are pretty special!." Having trained and competed at the highest level in my sport for the past 10 years or so, I always incorporate the rules of my previous training plans into that of my clients. (I actually wrote the training plan that led to my 2010 Commonwealth Gold Medal as I was coach-less at the time.) I think of every client as an athlete, and their development is shaped like a pyramid you start with the wide foundations based on general physical conditioning and then you build your athlete on top of that. I have watched THE PROTEIN WORKS™ innovate like no one else in the sector over the past two years which is absolutely key in sports nutrition today. It's all about challenging norms, and pushing the needle in terms of cutting-edge ingredients and formats to open nutrition up to a whole new audience. The importance the guys place on premium, ultra pure ingredients is something that fits very much with my own philosophy. The fact TPW™ offer alternatives to traditional whey protein also means as an IBD sufferer, that I can avoid lactose in my diet as it often flares up my colitis. 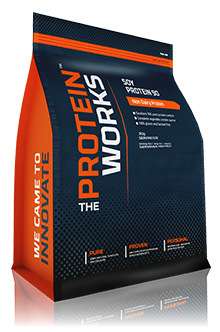 I find TPW™ Soy Protein 90 an excellent alternative. 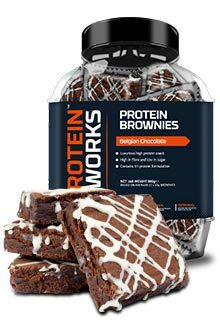 How do you include TPW™ Protein Brownies in your diet as we know every one of your orders includes those nutritional gems? I usually crave sweet treats in the evenings like most people, especially if I've had a hectic day. So it's important that I can opt for a healthier, higher protein, lower carb snack to satisfy my sweet tooth and one that won't have me finishing the whole tub! Because it's packed full of protein, you don't feel sluggish or guilty like you would if you ate a normal chocolate brownie. I feel like I haven't compromised my diet as it's what I would call 'a clean treat'! The TPW™ Protein Bakery is an incredible place and once again shows what the team are doing to radically alter traditional sports nutrition and create protein snacks that don't require a strong jaw to consume! With the Podium Effect you talk about how active people have an elevated nutritional requirement compared to sedentary people, how do the two compare? Whilst I think it’s important all athletes, and actually anyone who leads an active lifestyle, use a comprehensive multi-vitamin, research suggests athletes have elevated nutritional requirements compared to sedentary people. I believe it's more important for sedentary people to take multi-vitamins as there is likely to be a correlation between those who are physically inactive and those who are lacking in essential nutrients, and "most" athletes "tend" to get their fill of vitamins and minerals from fresh, quality produce. Can you talk around the benefits of fats? Too often people shy away from them, but your views on them are refreshing. 2. Fats are essential to unlocking and absorbing vitamins and minerals in our bodies! POW! How important is protein in recovery for you and choosing the right protein to work with your Nutrigenomics and digestive health? Recovery for me is vital as it ensures that I remain injury and illness free and as I'm now self employed every day counts. With my gruelling schedule, I can't afford to be out of action for prolonged periods of time. Protein plays a key part in ensuring I am constantly on the money day in, day out. I make sure that I get adequate nutritional replenishment post training to minimise the risks of injury/illness, but I also have to take into consideration that I am a colitis sufferer so I have to try to keep my digestive system balanced. As a result, I opt for soy protein wherever possible over whey protein due to the absence of lactose which could cause my colitis to flare up.